John Moran Auctioneers hosted their biannual Art of the American West and Turn of the Century Design auctions on Tuesday, June 19th, and the buyers came out in force. Each auction opened to a standing room only crowd, with plenty of additional interest coming in via the online platforms (Liveauctioneers, Invaluable and AuctionZip), absentee, and telephone bids. The Turn of the Century Design sale featured 113 lots, while the Art of the American West auction comprised a total of 402 lots. Moran’s Turn of the Century Design auctions feature craftsman furniture, Arts & Crafts art pottery and metalwork, Tiffany and Steuben lighting, glass and table items, and more. Moran’s June 2018 Turn of the Century Design sale was the inaugural event of its type for John Moran Auctioneers, and the sale achieved an 89% sell-through rate overall. The catalogue included a large number of pieces from the important Estate of Pasadena-area Arts & Crafts collector Gary L. Booth. Booth’s collection was high quality and wide-ranging, with pieces by Gustav Stickley paired alongside contemporary Arts & Crafts furniture by makers like Allan Cole. The quality of the selections brought out the bidders in force, with the sale opening to a full crowd of attendees and a large queue of bidders in virtual attendance. Arts & Crafts furniture made up the majority of the Turn of the Century Design auction offerings – two of the most anticipated lots from this auction were furniture selections from Cincinnati, OH makers Shop of the Crafters, each of which were decorated with the company’s signature fruitwood inlay and assigned very conservative pre-auction estimates. A pair of Shop of the Crafters “Mission Morris” chairs flew to an exceptional $8750 selling price, with multiple telephone bidders driving up the price in competition with one another (estimate: $400/600). A “Crafters Book Case” was also a popular lot, with bidders vying for the piece on the phone and by left bid (price realized: $5000; estimate: $700/900). Stickley furniture pieces also proved popular; a classic Arts & Crafts bow-arm Morris Chair by L. & J.G. Stickley brought $6875, just over the $4000 to $6000 estimate. Later in the sale, a sweet Newcomb College pottery lidded cream pitcher with flowering vine motif signed for Roberta Beverly Kennon and Joseph Fortune Meyer stirred up plenty of interest on the floor and among telephone bidders, finding a final selling price of $6250 (estimate: $1000/1500). A rare hammered copper vase with applied verdigris eucalyptus branch by Hans Jauchen’s Ye Olde Copper Shop in San Francisco, CA, came to the block with a $300/400 estimate. The vase, dating to circa 1920, drew immediate attention from online buyers, selling for $2375. John Moran Auctioneers followed up their short Turn of the Century Design auction with a 402 lot Art of the American West sale, comprising Western genre-paintings, prints and drawings, bronzes, Navajo textiles, Native American basketry, and beadwork, alongside Western saddles and other objects. Two important collections made up a large swath of the consigned lots; the majority of the beadwork lots hailed from the The Towaoc Trading Post Collection, Ute Mountain Ute, Towaoc, Colorado. Approximately 30 lots of basketry from tribes ranging from Alaska to the Southwest were consigned from the estate of life-long collector Roberta Krell Cagan, whose enthusiasm for Native basketry was reflected in the quality of her selections. Top-lot status for the evening went to a masterfully woven Navajo classic period child’s wearing blanket dating to the mid-19th century. A rare find, the child’s wearing blanket started a bidding war between two telephone bidders which topped out at a final selling price of $93,750. A later example, this one an early 20th century Navajo revival period child’s wearing blanket from the collection of Roberta Krell Kagan with bright geometric bands in orange, green, red and crimson was also offered, earning $2500 (estimate: $600/900). Selections from the Towaoc Trading Post Collection earned respectable prices throughout the evening, with select lots exceeding expectations. A group of three flat beaded bags with exceptionally fine and detailed pictorial beadwork went to the block with a conservative $800/1200 estimate. Collectors were wooed by the bags, which quickly earned a final selling price of $1187. Also of exceptional quality, a beaded pictorial vest decorated with deer and flying eagles on a sky blue ground brought $937 (estimate: $600/900). Prices for basketry were strong throughout the evening, with baskets from all over North America (most of which hailed from the aforementioned collection of Roberta Krell Cagan) bringing out the bidders. Pictorial examples garnered particularly impressive prices realized. A Cahuilla Mission spider-motif basket in the typical globular shape brought $2000 (estimate: $1000/1500). 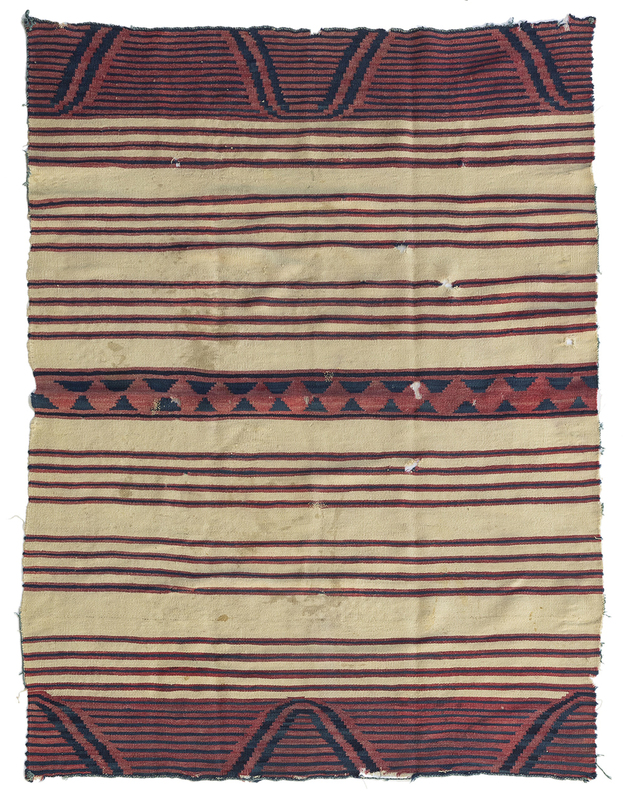 Another polychrome pictorial example, this one from the Havasupai tribe and adorned with three orange-winged butterflies, earned $1625 (estimate: $600/900). A Wasco Indian lidded pictorial “Sally Bag” with leather-wrapped rim was brought to the block with a $1500/2500 estimate. Featuring butterflies, human figures, deer, water bugs and birds, the basket found a buyer for $2000. A Yokuts/Tulare Indian polychrome basket with rattlesnake and standing figure motif incited a bidding war between two determined floor bidders, bringing $1875 (estimate; $1200/1800). A group of Pima baskets with varying figurative and animal motifs was a surprise highlight, bringing an exceptional $3125 for the group of eight (estimate: $1200/1800). In addition to many of the above, the Cagan collection proffered a number of wonderful Klickitat imbricated baskets, including one decorated with dogs, deer, and male and female figures (estimate: $1200/1800; price realized: $2000). Pottery lots modern and antique provided some surprise highlights. A San Ildefonso pueblo pottery jar by master potters Maria and Santana Martinez garnered a flurry of interest online prior to the sale’s start, and brought an exceptional $2000 (estimate: $300/500). A contemporary Zia pottery vessel by artist Elizabeth Medina was expected to bring $400/600, but ultimately garnered $1125. Hailing from a Sacramento-area collection of 18th century and earlier pottery vessels, a Casas Grandes polychrome jar in excellent condition with easily identifiable parrot head motif achieved a $531 price realized (estimate: $300/500). The fine art selections within the Art of the American West Auction ran the gamut from Edward Borein drawings and prints to large-scale works by Hernando Villa. A moody oil painting by modern Western painter Ted Long (1932-2007 North Platte, NE) titled “Slicker Time” depicted cowboys herding horses just as dark rainclouds are broken overhead to reveal a pale blue sky. The piece exceeded its $1000/1500 estimate, achieving a $2125 selling price. A crowd favorite, James A. Fetherolf’s (1925-1994 Camarillo, CA) “Sedona’s Matterhorn”, was an exceptionally detailed oil painting of brush-dotted Arizona mountainsides beneath billowing clouds; “Sedona’s Matterhorn” brought $4375 (estimate: $1500/2500). California Western painter Stanley Galli (1912-2009 San Francisco, CA) was represented in the Art of the American West catalogue by a small selection of works, including the artist’s “Two Card Monte”, depicting vaqueros playing cards (estimate: $1000/2000; price realized: $4687). A sweet painterly work of donkeys before adobe structures by Terri Kelly Moyers (1953-* Santa Fe, NM), was expected to bring between $1500 and $2500, garnering $1750 thanks to interest from floor bidders. A charming view of a path through a California redwood forest by California painter Charles Henry Harmon (1859-1936) achieved a $1375 price realized, just over the $600/900 estimate. Fans of redwood scenes should take heed: the Private Hydesville, CA collection from which the painting was consigned is also the source of a number of other Northern California redwood works which will be offered throughout the next year in Moran’s August, October and January 2019 fine art auctions. A rare late 19th century Winchester “Double W” advertising board found many interested buyers casting bids online; in the end, the piece achieved an astounding $25,000 price realized (estimate: $15,000/20,000). A Bohlin 14K gold ladies belt buckle went to an online bidder for $1875 (estimate: $800/1200). A Handsome 1940s Keyston Brothers silver-mounted parade saddle with matching tapaderos was assigned a $5000/7000 pre-auction estimate; when the dust settled, the saddle had brought $5625. A lot comprising two polychrome Tlingit rattle-top baskets inspired bidders from both online platforms to jump into the fray against a telephone buyer; the baskets sold for $1187 (estimate: $600/900). John Moran Auctioneers is now consigning Arts & Crafts furniture, art pottery and metalwork as well as Native American and Western art and objects for their December 12th Turn of the Century Design and Art of the American West catalogues. For more information regarding any of John Moran Auctioneers’ auctions past or present, or to speak to a specialist regarding the consignment process, contact John Moran Auctioneers directly via email: info@johnmoran.com or telephone: (626) 793-1833. John Moran’s upcoming auction calendar also includes a July 17th Traditional Collector auction; an August 21st Studio Decorative Art and Studio Fine Art auction; a September 12th Women in American Art auction; an October 23rd California & American Fine Art auction; November 13th Prints & Multiples and 20th Century & Contemporary Art & Design auctions; and December 11th Fine Jewelry and Studio Jewelry auctions.